In this edition, we are going to speak about the frost-free refrigerators for commercial use. It is the second issue of a series which began dealing with household models. We are going to recall briefly what a frost-free refrigerator is: it is a model which has an automatic defrosting system (Read more about this subject). As it is disclosed more to the general public as a differentiation factor, it may appear that this resource is only used in household refrigeration. But is is also common in commercial refrigeration equipment. 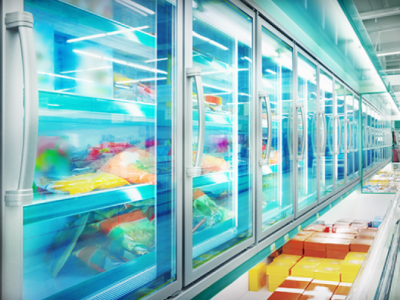 In commercial refrigeration systems, there is a greater potential of forming ice due to the more frequent opening of the doors. Think about the equipment present in bars, bakeries or supermarkets. They are handled every day by dozens of people, who often maintain them open for a long time to choose the product. 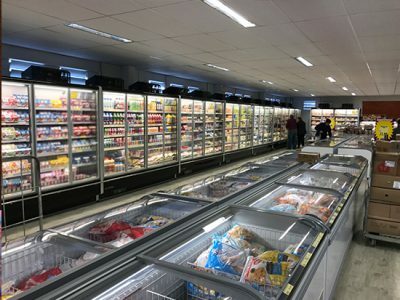 In systems without a door – such as refrigeration aisle –, this potential of forming ice is even greater. This is because the humidity present in the air around them does not have any blocking of its entry in the system. While in the household frost-free refrigerators the defrosting system always uses electrical resistance to heat the region with accumulation of ice, in the commercial systems this is only one of the ways used to eliminate the accumulated ice. In the beer displays, for example, the system used is very similar to that of household refrigeration: resistors linked to a temperature sensor, which are activated by a timer, melting all the layer of ice which is formed on the surface of the evaporator. While the displays developed for drinks which do not need to be so frozen (such as water) do not require electrical resistance. Only the normal cycle of the compressor is already sufficient to melt the ice. There is no forced defrosting with the use of resistance. 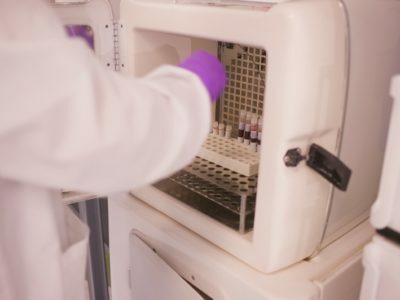 But it concerns a frost-free system, as it has a drain and tray and does not need to be disconnected disconnected periodically for defrosting. A technology which does not exist for the household refrigerators and is used in the commercial ones is the so-called defrosting by hot gas (the gas, in this case, is the cooling fluid). This resource is present in larger systems, such as the large chilled aisles of supermarkets or the larger beer displays. With this technology, the cooling fluid passes hotter by the evaporator, avoiding that the ice accrues there. The defrosting is more efficient than in the cases in which resistors are used, because it occurs directly in the evaporator. (In the case of resistors, they are not in the evaporator, but close to it, which reduces their efficiency). For the defrosting by hot gas, a directional valve is required at the output of the condenser. 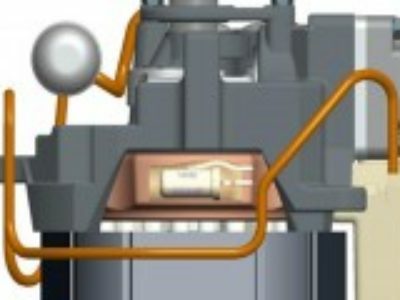 Activated by a timer, this valve makes the cooling fluid pass from the output of the condenser directly to the evaporator, without passing by the control element (expansion device), which would chill it. Regarding energy consumption, defrosting by hot gas can bring certain advantages. There is a peak of use of energy to heat the fluid (in gaseous form), but the system as a whole consumes less, if compared with the ones which use electrical resistance (which are activated by more time). Defrosting by hot gas has certain advantages, but it is necessary to be attentive to its possible impacts. While resistance can be used with several models of compressors, without causing any impact on the design of the system, hot gas requires a stronger compressor (such as the models of the NTU family of Embraco). Furthermore, the system needs to be well balanced, to avoid the flow of the compressor rising a lot – which generates a risk of damaging the compressor valve. As occurs with the household frost-free refrigerators for commercial use, the commercial systems with this technology are subject to problems which lead to leakages of water and accumulation of ice. What is different, in the commercial systems, are the risks associated with the technology of defrosting by hot gas, already mentioned: damage to the compressor valve – which, in general, are caused by failure in the design of the system (including with the use of an inappropriate compressor) and by repairs poorly executed. In the case of leakage of water, in the external side of the refrigerator or internally, the causes and the solutions are the same as the ones already reported for the household frost-free refrigerators. Reposition the drain, so that the defrosting water ceases to fall outside the tray, running to the floor. Clear the drain or, if necessary, change it, to resolve the problem of accumulation of water, caused by dirt or by being compressed. While the problem of the accumulation of ice occurs when the defrosting cycles are not able to defrost all the evaporator. In these cases, the ice usually obstructs the flaps of the evaporator, after having accumulated gradually in them. This usually occurs in very hot and humid environments. And also by the very frequent opening of the refrigerator door – which, as we have already said, is strongly linked to the main uses of commercial refrigerators to which the public has access. 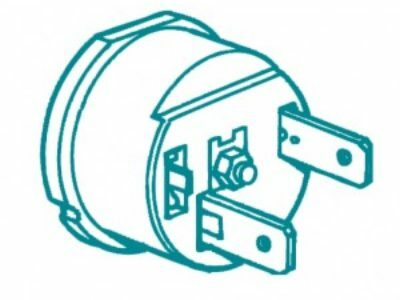 The ventilator of the evaporator does not disconnect or locks. Besides these causes, which are the most usual ones, other electrical components of the equipment can also be at the origin of the problem. Therefore, it is essential to check the electrical continuity in each one of them. If anything wrong is noted, replace the component.